As many of you know, breakfast is my favorite meal of the day and eggs are my favorite food. But what you may not know is that usually I have 2 breakfasts a day. I start off with oatmeal and then for my second breakfast I have eggs. In the fall and winter months, I have my Holiday’s in your Mouth oatmeal recipe, and in the summertime I’ve discovered a new oatmeal concoction that I can’t get enough of. Bring water to a boil & add in oats. Turn burner down to medium or medium-high. I now prefer steel cut oats which is less processed, but you can substitute whichever kind of oats you like. As the oats are cooking, stir in cinnamon. Since I like a lot of cinnamon, I usually put in about 5 dashes. Once the oatmeal starts to thicken a little, stir in banana. The more ripe the banana the sweeter it is. For this recipe, I prefer a very ripe banana if you have it. Keep stirring so the banana becomes almost gooey. Stir in peanut or almond butter and mix well. Once the oatmeal is at the consistency you prefer, stir in fresh raspberries until they become warm. 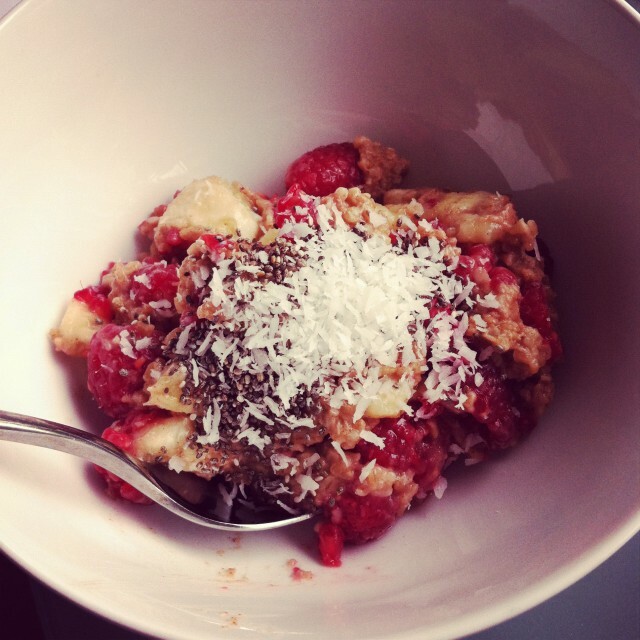 Spoon oatmeal into your favorite bowl and sprinkle coconut and chia seeds on top. It’s delicious and the coconut makes me feel like I’m in the tropics or on an island far away from home. Now you have a summertime oatmeal recipe with all the nutrition you need to start your day off right. and more fiber and minerals from the raw coconut. If this isn’t a good way to start your day, I don’t know what is!